There is a door we tap. No need to knock it hard, just enough to draw the bouncer with the clipboard out. We watch the people come and go, adding their names to the host’s list, too. They linger a breath, playing with the buttons on their coats or adjusting their scarves, before slinking off to find a quicker drink. We doubt they’ll return, already on to some other heartbreak; because, at this time of night, heartbreak’s all there is. But we—we stay. Too old for heartbreak, or so we think. You wipe the dust from your glasses. I shift my weight over heels I wish I hadn’t worn. Arthritis rises in the knotty branches of my toes like my grandfather before me. The grandfather I barely knew, whose name is a whisper at family gatherings. A hush just like the cirrhosis that took him. We stay and stay, waiting our turn to be invited inside, in the night that already has the photo about it, the sepia of images printed in darkrooms, exposed until the green inside the black comes out. Photos still wet, smelling of the chemical from which they were born. “Tailors – M.H. 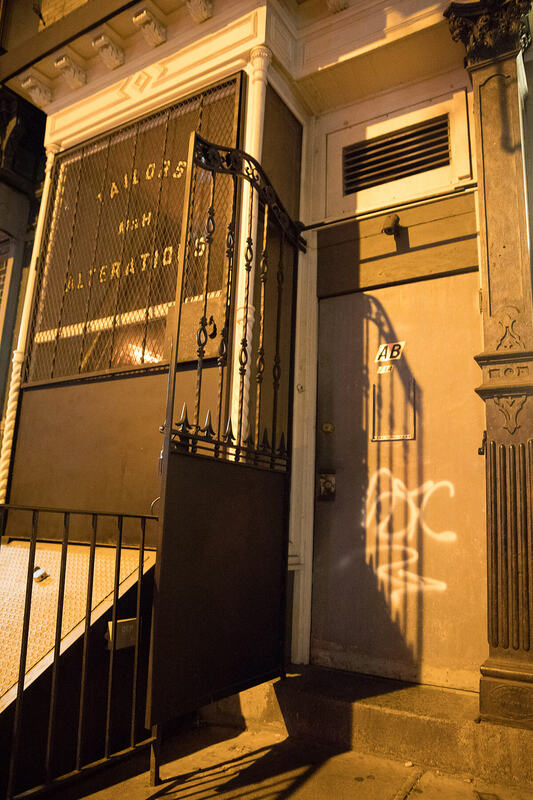 – Alterations” the sign says in letters so yellowed and black they seem harvested from death. You tell me the story of this speakeasy, once a needle worker shop, now the land of Milk & Honey. You speak of the man who established it, who died young last summer, stitched apart by too much life. The drink and the meat of it. I sway, my body filled, too, with drink, swaying on purpose like I did when first we walked together, teenagers still, on banks of rivers and by stone of church, swaying into you like a drunken daisy looking for a perch, and once we crash, I hold on tight, grasp your hand, lean in. How good it is to spend a life with a man who knows the secret doors. The seedy ones with corners full of grit. The ones we circle and circle and almost cannot find. Our sense of direction having been whittled down. Having never been that strong. The host calls our name, and you take my hand. We step inside this old tailor’s haunt, joining the small band of men and women who have already settled into their drinks, wrinkled their pants against the stools. The place all of wood, the light just a flicker. Candles so quiet. Yet if one should fall, its flame would surely find our wick. Too dark for menus, for looking deep, we let our eyes relax. Dilated, we watch the barman—big rock of ice in his hands, dripping slow. He shaves and shaves and shaves. The long, metal pick seems almost gentle for the force it exerts. Edge by edge by edge until the ice fits perfectly, lovingly, to the glass. Maureen Langloss is a lawyer-turned-writer living in New York City. She serves as the Flash Fiction Editor at Split Lip Magazine and as a nonfiction reader at The Indianola Review. Her work has appeared in Atticus Review, Bird’s Thumb, (b)OINK, Jellyfish Review, Necessary Fiction, the Prairie Schooner blog, The Timberline Review, Wigleaf, and elsewhere.